It’s time I revealed a little bit more about my book. I’ve created this website for my future exploits as an author. I’ve told you that I’ve been writing (and writing and writing). I will tell you that I’ve been editing (and editing and editing). But, right now, it’s time for a moment of fun in between all that work. It’s not set in stone quite yet, but it has all the elements I wanted on there: Uhm, Mount Kilimanjaro and toilet paper. Actually, I had no idea what I wanted on there. That’s why I hired a professional. All I had was a bunch of pictures with the instruction to “make it humorous.” I really did not plan to have myself on the cover of my own book, to be honest, but Nicole has done a wonderful job of drawing a good-looking cartoon version of me, don’t you think? The reason it’s not set in stone yet is that I cannot make up my frikkin’ (as co-climber and major character in the book Mike would say) mind about the title. This is just the working title. Nicole thinks it’s too long. “You should leave some of the story for INSIDE the book,” were her words. I don’t disagree. My husband hates the word “housewife.” Although he doesn’t ever complain about it when I do the things that housewives are supposed to do, quite the contrary. I can’t decide. Do I have to have the word Kilimanjaro on there, or is the image of it enough? Will spelling it out make it look like just another travel guide? Will the more mysterious Pole Pole better draw potential readers in, or only people who’ve climbed Kili before? Will it bother people who won’t know how to pronounce it? Will only armchair-traveling housewives buy my book? Is there anything wrong with that? Armchair-traveling housewives are the ones who initially gobbled up Fifty Shades of Grey, aren’t they? Though I admit armchair-traveling in a slightly different direction. And no, I don’t go in that direction, before you get your hopes up. Other than perhaps a few fantasies of my altitude-addled brain. Which also had trouble distinguishing between reality and fantasy, just to be perfectly frank. Perhaps I can’t do too badly in the title department. I just came across a Kili memoir that had the word Zombies in the title. Zombies, you guys. I can’t do much worse than that, can I? Still, tell me what you think. I need to make up my frikkin’ mind. Yep, you’re not the only one and I’m grateful for the feedback. I’ve always seen a lot of irony in using the term housewife, precisely because it’s so 1950s, and because it’s pretty clear that someone climbing Kili would probably not be your typical housewife, but it’s good to know everyone’s first impression, as that is what counts. Just saw the comments on FB. The fact that you’ve got people gyrating can’t be a bad thing… At the same time, I think you want to be careful not to use hot button terms that turn off folks who don’t know you so they don’t even take another look. Will be interesting to see how this turns out! I was thinking the same, Jude. All those people talking about my book can’t be a bad thing. Also makes me think that a whole other book could be written about the term housewife and the fears and insecurities it invokes in people. I think you should call it simply “Loo’s”. Or perhaps “Movements” – which on reflection is much more suggestive of all the changes and goings on on the trip. I know what pole pole means (my first African trip was to Tanzania) but I do think people might be confused by that in the title. I personally like the title that you have on the cover right now. 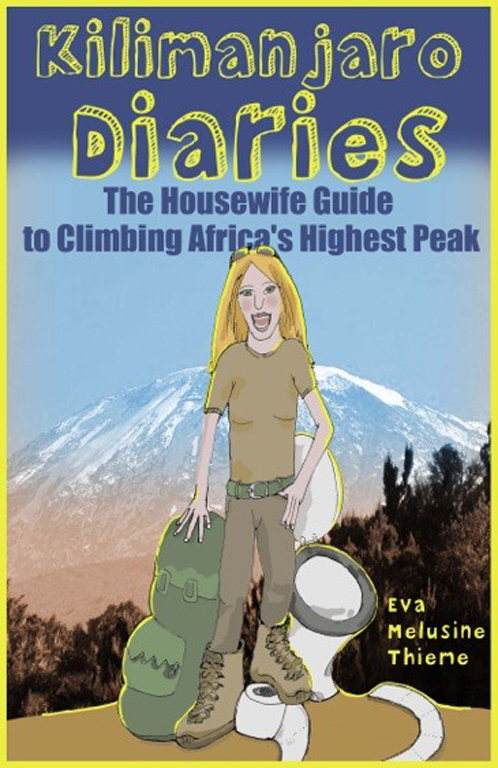 But I also like the more simple: “A Housewife in the Roof of Africa” with maybe a subhead that includes the word Kilimanjaro. Regardless, this is all very exciting. Thanks 2summers, love getting your opinion! I also like the combo with Kili in the title and the simpler subtitle, just because the other is too long I think. Housewives could be attention-grabbing here in CA. But not in a positive way, at least among people I know.